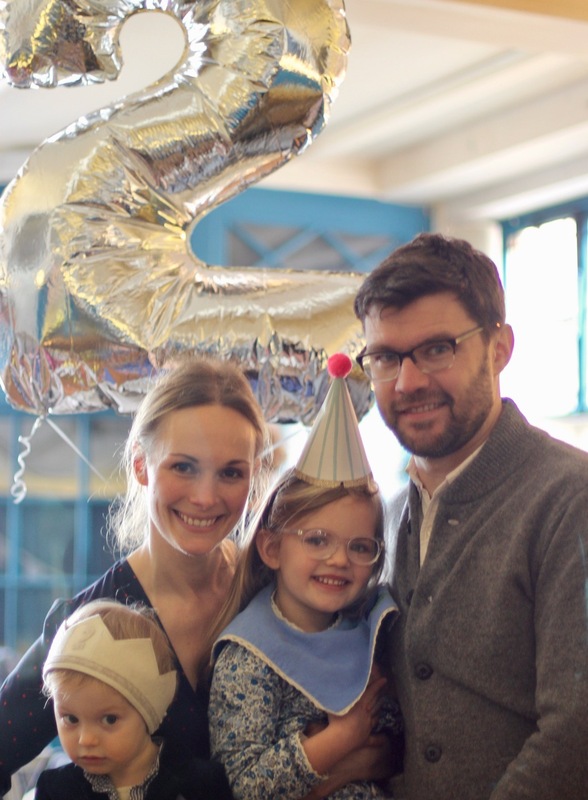 To celebrate Joseph’s second birthday we decided to keep it super simple, and the end result was a very special party. It was last minute — we organised everything in exactly one week. Sometimes life is just so busy! So instead of an amazingly involved party theme (although I do love those as well), I am going to share our easy party with resourceful, waste free, repurposing, and cost effective tips! Hopefully these ideas will be useful for your birthday planning. It made our party a big success and was free of stress! Invites: Fortunately I had a stash of wallpaper samples with cute animal illustrations on them. 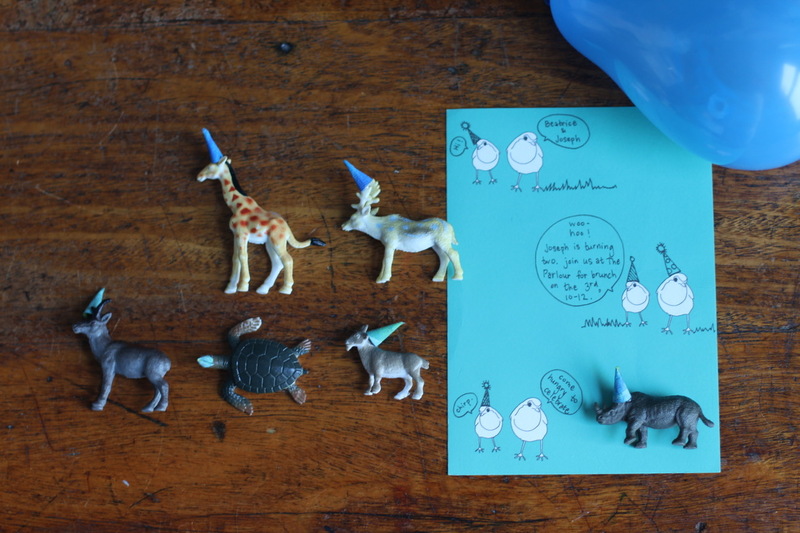 I then drew some party hats and little speech bubbles to personalise each invite. This is when the party animal theme began, it was that spontaneous! You could probably find other similar images from magazines, illustrations in books, etc and add hats on. Or use stickers, stamps, etc to decorate. 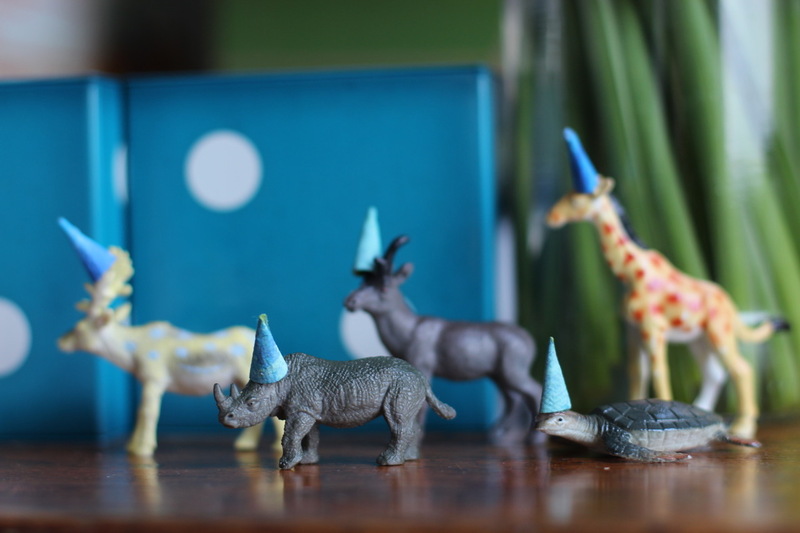 3-D Party animals: To decorate the top of the cakes, I made little party hats out of painting paper scraps. These animals were a hit! They provided entertainment and also doubled up as a party favour gift, too. 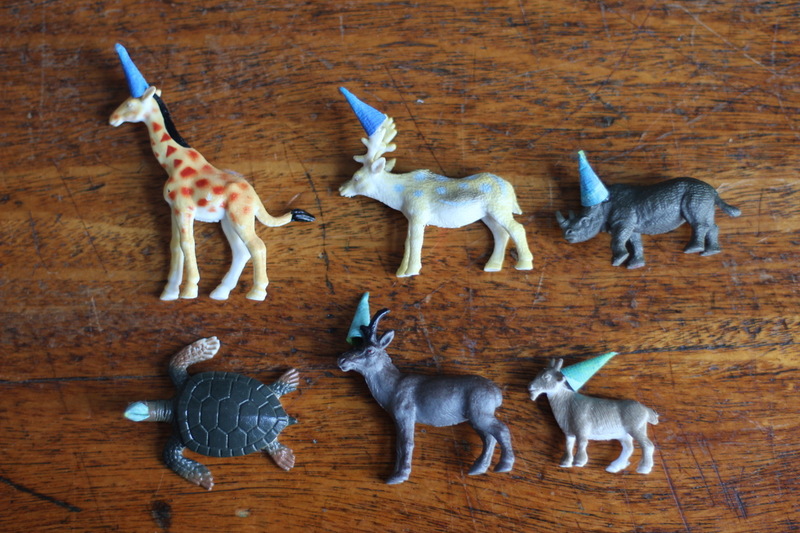 Easily make hats with some paper scraps and a hot glue gun, then stick them onto the animals at jaunty angles to add a bit of humour. Venue: In the past we’ve had birthday picnics in our local park, but not this year since there was snow on the ground! And instead of hosting the celebration at home (we live in a small urban flat), we chose a favourite restaurant in our neighbourhood to keep it local, simple, and easy for us and our friends to walk to! 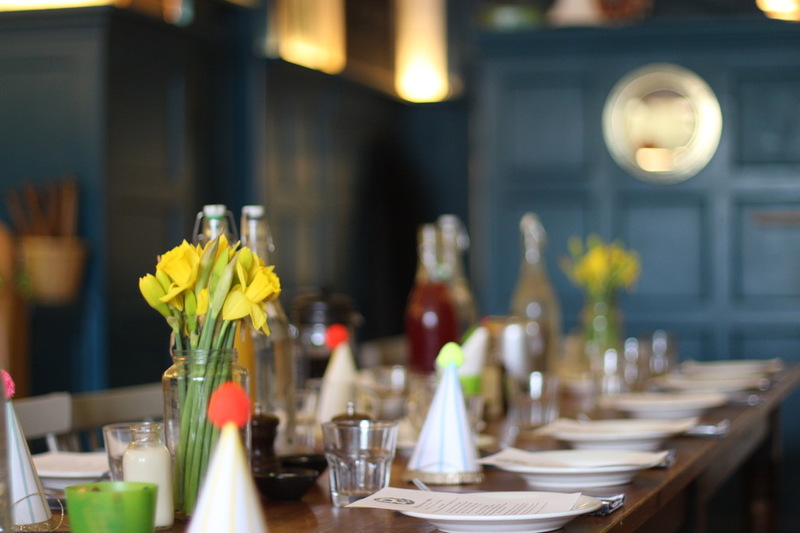 Then we booked a table for an early brunch, with a sharing menu so it was family style without any fuss. It also made for such a fun and family oriented atmosphere. Also, we realised that by doing this it was more cost effective than renting a hall, an entertainer, or having a big party with tonnes of people. We liked the intimate size, and although we would have loved to do it at home if space had allowed, it was nice to avoid the cooking and the mess. We did however arrange in advance to have all extra food put in doggy bags so we didn’t have extra food waste (and we had a meal later that day). 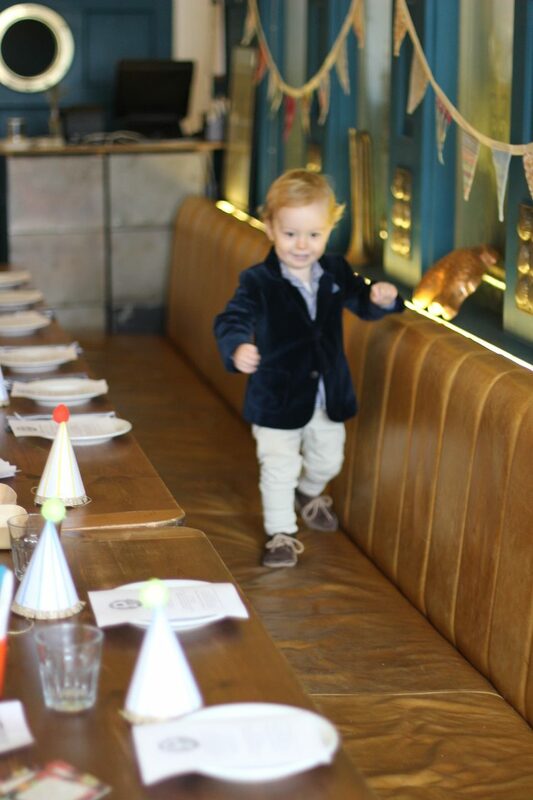 Party planning: The day before the party, we casually visited the restaurant to discuss seating plans, high chairs needed, and the menu. But the main reason was really so Joseph could get used to the surroundings. 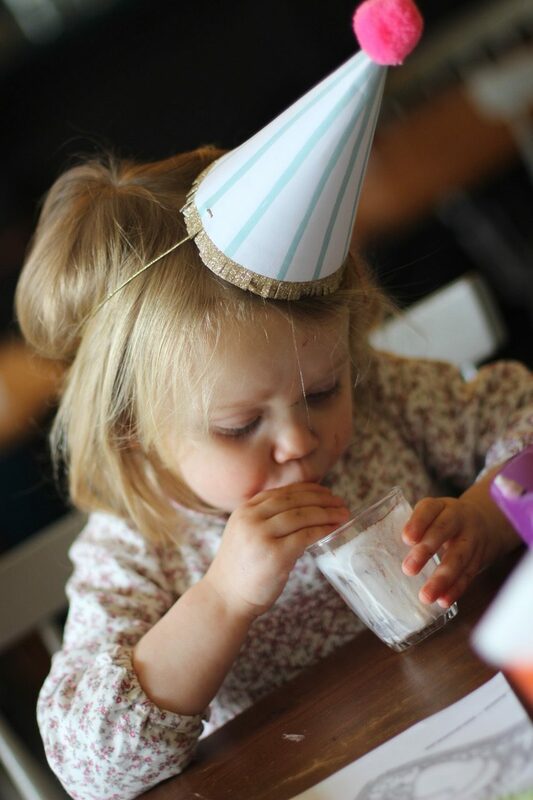 A two-year-old’s party shouldn’t overwhelm them! He is much more comfortable, and himself, when he is in a familiar place. This was super helpful on the actual morning of his party — he wasn’t clingy and he had fun at his own party because the surroundings were familiar. This wasn’t the case with our eldest, but I think it is good to think of how each child has different needs. Timings: We started the party at 10am and were finished just after noon. The perfect amount of time for a child’s party, and just before nap time. We also got in and out of the restaurant before peak brunch time began. Yes! 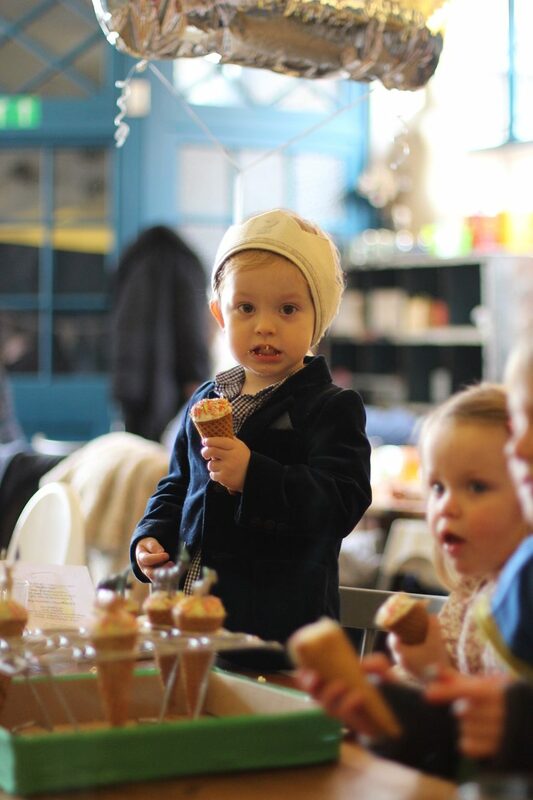 Cake and decor: I made the children each a cake — ice cream cone cupcakes actually. These cupcakes are award winning with little ones, and my mom used to make them for us when we were little! This cake cone holder folds open and is genius, you both bake and then serve from it. Delicious with your favourite cake recipe and a great surprise for everyone (surprise, it’s not ice cream!) Just bake with normal waffle ice cream cones and add sprinkles on top of the icing of course. Festive and fun. For other decor I spent a few pounds on some flowers, reused glass jars from our kitchen, and reused party hats that we adore. We had homemade bunting and a balloon that we had been gifted from another friend’s previous second birthday. I think it is so clever to think of how you can share, reuse, and repurpose decorations! 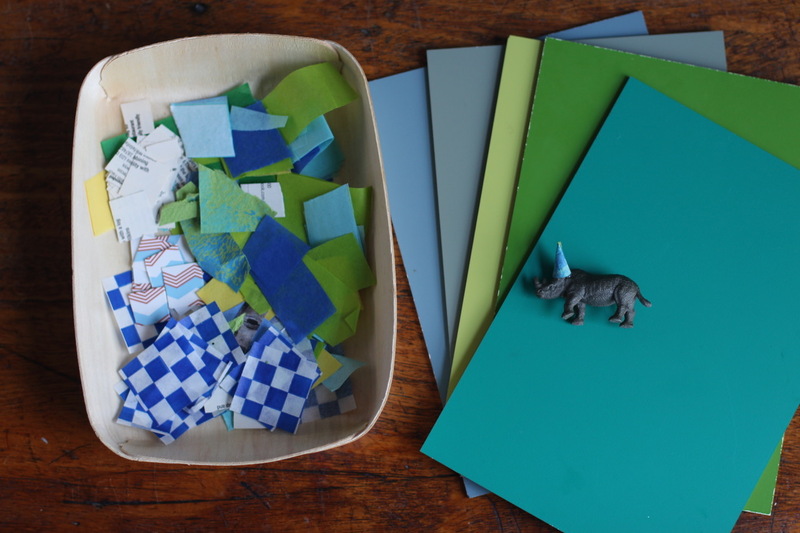 Crafts: I brought our favourite home made play dough (in blue and green of course!) to play with. The kids even made play dough cakes with it! 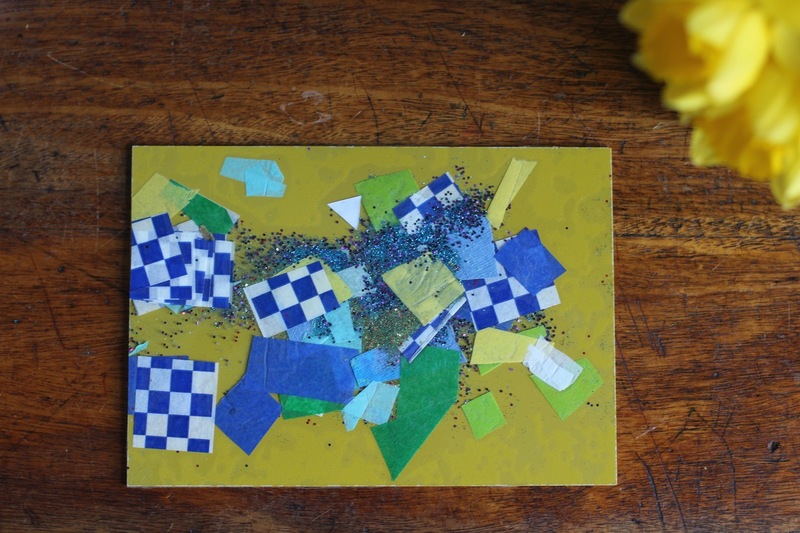 We also made collages with some trays filled with scraps of paper and clear contact / sticky paper (so glue and scissors weren’t necessary). It was all using items in the house — free and environmentally friendly. And the kids enjoyed colouring and creating art between courses. Goody bags / party favours: A great alternative to goody bags were these lovely dice I bought from Hedgehog Shop. 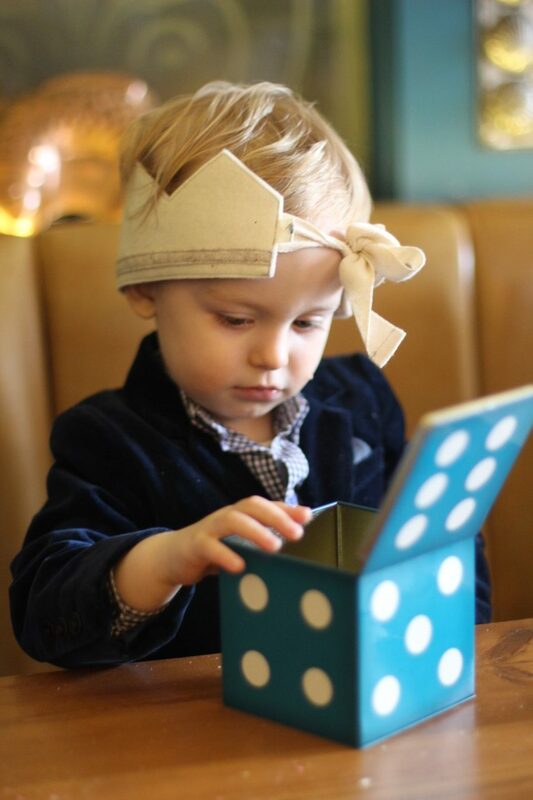 Based on vintage designs, they open up and are a permanent solution not just a gift for the day. A great addition to any bedroom for your child’s favourite treasures! I love the shade of bright vivid blue (they also have red dice). But the kids absolutely LOVED this instead of good bags, and thought they were getting the most amazing present! Inside contained two crayons, two tattoos, and two balloons. It was the biggest hit of the day. 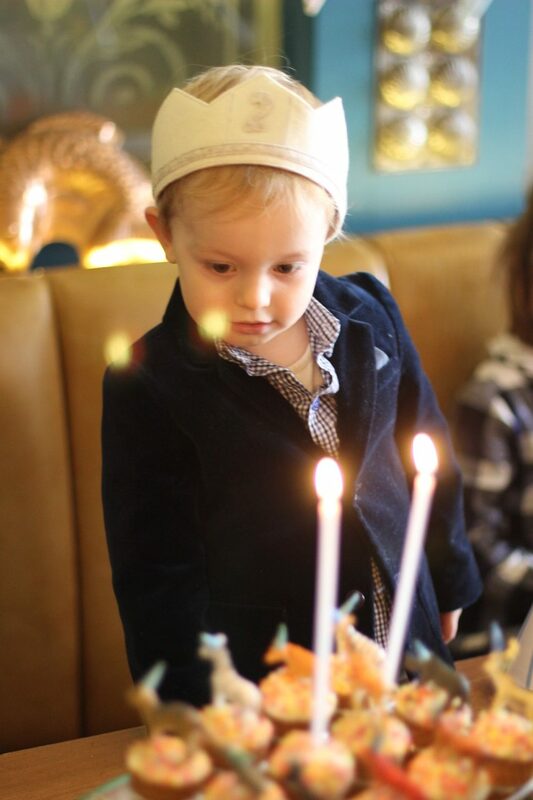 Party crowns: DandelionBabas make 100% eco-friendly, 100% wool felt cute accessories, so as one of Joseph’s gifts, we made sure he had this crown to proudly wear at his first real birthday party! 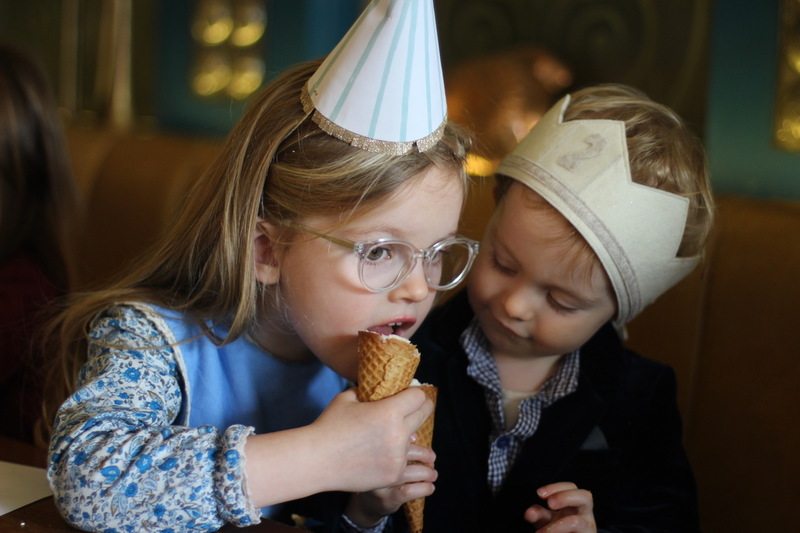 Birthday crowns are such a fun tradition, we just had to adopt it! 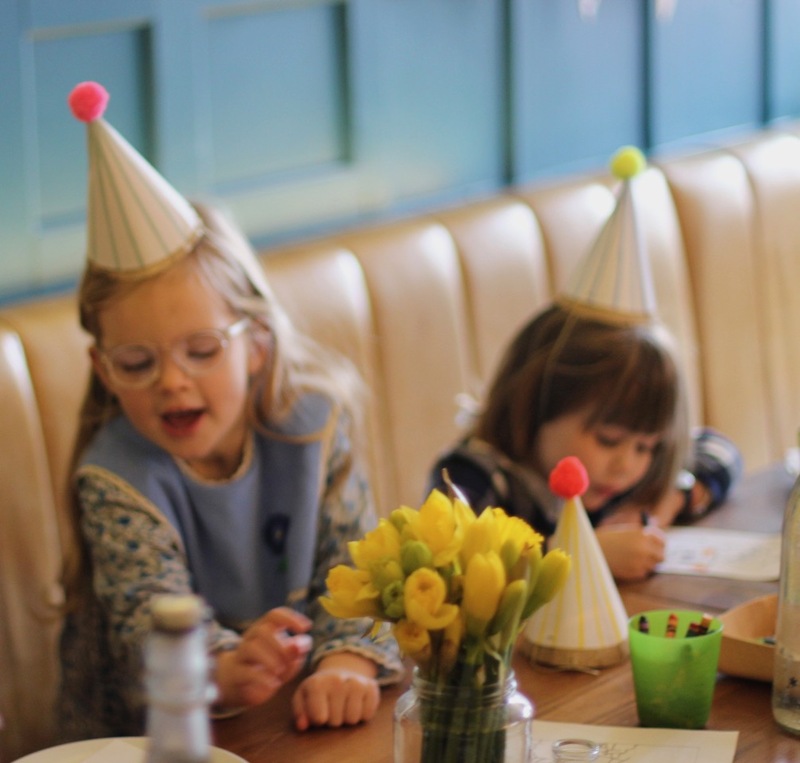 We hope these tips are helpful in considering birthday parties in a different way. If nothing else, as a way to assist you in any last-minute party planning. It’s very satisfying to bring creativity and resourcefulness into any party plan, I think less is really more! Do you have any good time, energy, or budget saving tips for party planning? 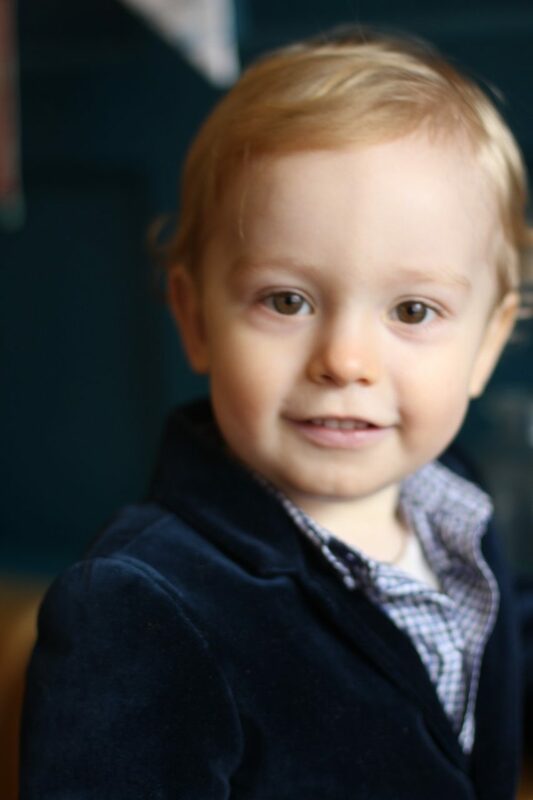 ps Other great second birthday ideas I love include documenting memories with a photoshoot (like Marlow had), how fun to capture such a special age! 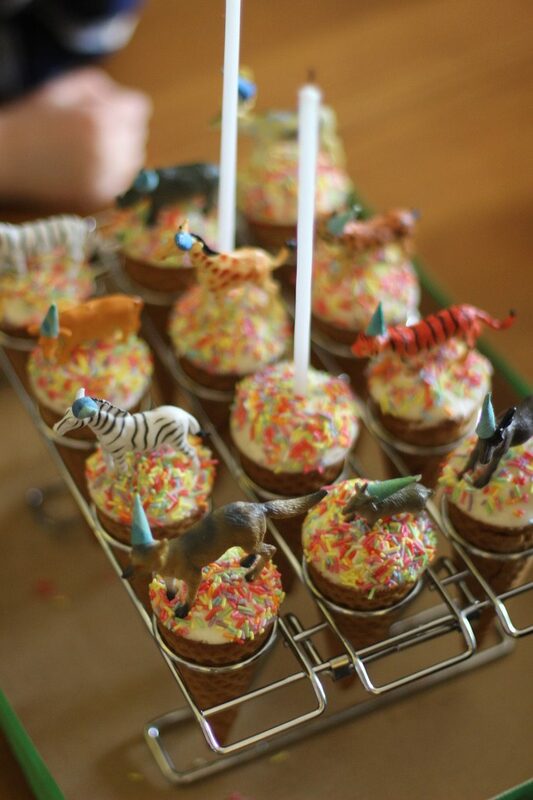 I also love thinking ahead to future parties I would love to have for Joseph like Esther’s stick themed party!…. 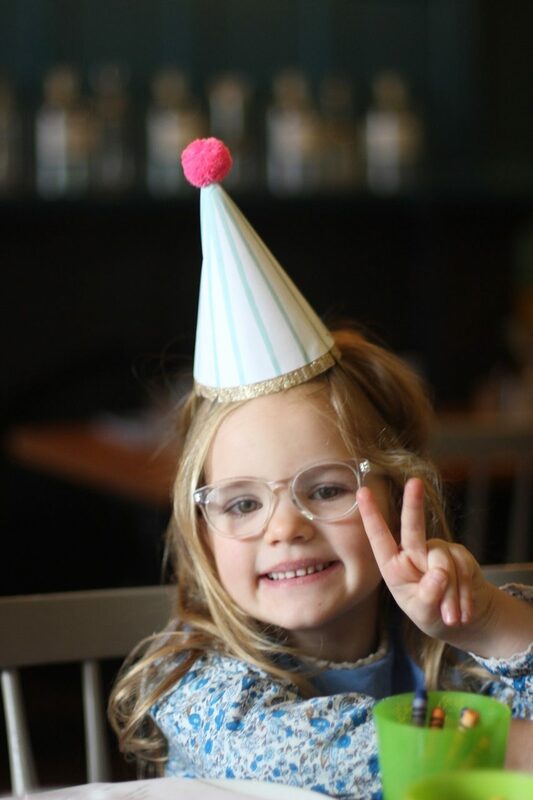 And don’t forget these great tips from Emilie on Simple Birthdays! I love the icecream cone cupcakes! Do you have a recipe to share? Hi, not sure if I missed it in the article but were are the little animals from? My mum has similar for her foster daughter in Oz but I haven’t been able to find anything like it here in the UK. Enjoy! Hope you have a wonderful party!